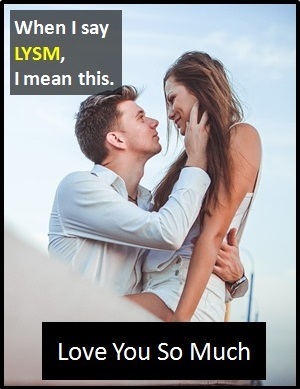 LYSM | What Does LYSM Mean? Abi: I'll pick up Jenny after class. Jim: Thank you, that will really help me out. LYSM. Don't know what I'd do without you. Of note, "Love You So Much" can also be abbreviated as LUSM. LYSM usually expresses sincere love. Dave: So, do you think we get on? Chloe: LYSM, I think I'm going to burst. Dave: That's quite intense for a first date. Simon: ILYSM I can't imagine life without you. LYSM is an abbreviation of the phrase "I love you so much". LYSM can be used as a standalone declarative sentence (i.e., a statement). In other words, it is not always used as another part of speech within a wider sentence.